OK, Stamping Rules Consultant kit fans, I'm finally ready to release Volume 5! Here is the second of three projects, the first being that Hexagon and Back Again Canvas/card set. Tomorrow evening I'll feature the third project, but all three are FINALLY ready to order on my Consultant Kits page today! I really appreciate all the emails and friendly encouragement to finish-quickly-hurry-last-week. You really put a smile on my face! This project is based on our awesome little card box and inspired by all the fun steampunk projects I've been browsing on Pinterest. Call it...steampunk lite, I suppose. We'll be heat embossing on our fab new glitter papers, distressing with sponge daubers on resistable tags, and adding sturdy little feet to the box to turn it into a fun Home Decor item. Inside the box are decorated tags for holding memory journaling or small photos. Plus since it's a box there's tons of space for that special masculine hoarder to keep his collection of randomness. A rock from here, a key from there, who knows why they collect this stuff, but a treasure box for his treasure seems fitting, don'tcha think? 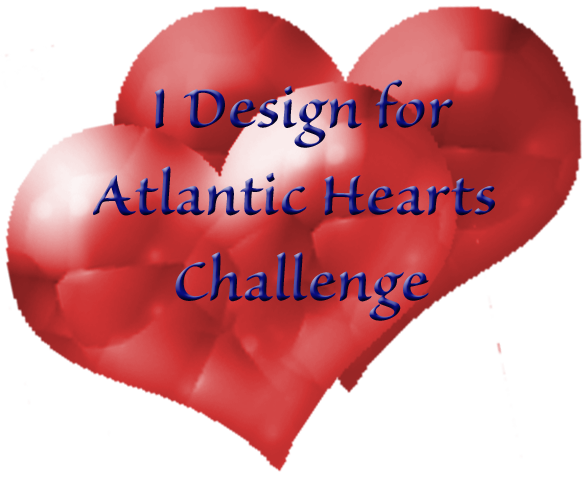 I'm linking this project to the Heart 2 Heart Tag You're It Challenge. I'm also linking to Bernadine's Tea Time Open House. See ya back here tomorrow night for the last project reveal! this si the card my team made at out meeting last night. Another CAS design, but I think that the upcoming Happiness Is Butterfly Album which I'll post Thursday night for Blog Hop might have sucked all the non-CAS creativity out of my whole body! 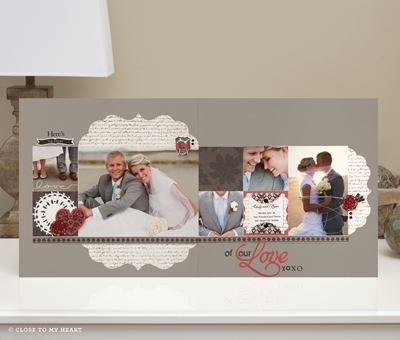 I love the look of the March SOTM 2 step stamps in Grey and Black - very simple but elegant! 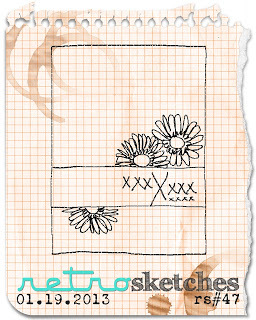 For this card I inked the base image for each flower in Whisper ink using a side to side swiping motion to give the solid stamp some texture. Can you see how it looks almost sanded? Then I added the detail image in Black ink on top, and a few leaves stamped in Whisper ink. The script paper is from For Always, and the bold diagonal stripe is another image from In The Background, which is quickly becoming an indispensable basic tool for me! 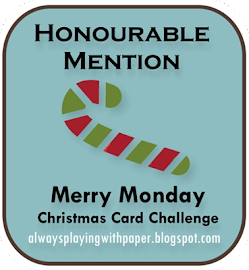 I'm linking this card up to this week's MUSE challenge. As I was frantically prepping for my team to come over and play yesterday I got the email from MUSE and fell in love with her clusters of flowers around the edge of the sentiment. I realized that while I love to make 3-D flower clusters, I have to admit that stamping these clusters was a LOT faster and easier! 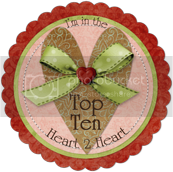 I'm also linking up to the Heart 2 Heart Love is in the Air Challenge and the CAS-ual Fridays Hi Ho Silver Challenge. Did you catch that awesome silver Glitter button? 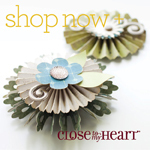 A touch of sparkle is what makes my heart flutter! Until tomorrow friends...yep - I've got new art lined up for you every day this week! I made the Top Ten - please vote! 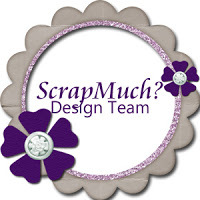 I can't tell all my Stampin' Friends how much I appreciate your support each week as I work my way through the Practical Scrappers Card Contest. With your help, this week I made the Top Ten! It's the last week for Public Voting, so if you have a sec, please pop out to THIS POST TO VOTE for your two favorites. 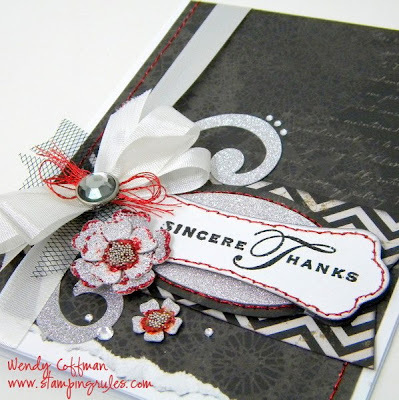 The theme is black and white with a pop of color, and the top ten cards are fab! Crossing my fingers...and feeling very grateful to all of you! So my FB buddies and Instagram followers all know that I was away on a four day beach retreat last weekend. Nothing better than a long weekend away with some of your favorite scrappy peeps to refresh and recharge the creativity, right? Until it's time to actually go and pack and remember everything you need to cook for a dozen or so people for four days and scrap projects and don't forget to finish order deliveries before you go and now you are two hours behind...and then you get the call that the beach house was double booked. ACK!! Where is the coffee when you need it?! That's right folks, the beach house double booked the weekend so half my group was already at the coast, half of us were still getting going and no one had a bed to sleep in...and my car had $400 worth of yummy, mostly whole food, organic eats packed in to the brim. Can you say panic attack? So I headed to the coast anyways, and the amazing Cathy L. pulled off a scrapbooking miracle, procuring us a fabulous room rate at the Comfort Inn Suites in Astoria, where they not only had comfy cozy rooms with microwaves and fridges, but hooked us up with a nice conference room with lots of tables to scrap in and paid no mind to the crazy woman in Room 320 who turned the sitting area of her room into a pantry while running two crockpots pretty much nonstop all weekend. We might have consolidated a few of the microwaves into one room when setting up the baked potato bar...moved most of the furniture in the lobby to accommodate our group picture...used a hotel rolling cart in an unapproved fashion...and my roommate might have had to deal with the smell of pork products constantly cooking in our room. By the way, you can cook sausage in the crockpot, and while it could be crispier, it sure was tasty! 1. Roses. Kasiakin got roses for Valentine's Day and they brightened the whole crop room. It's almost as good as getting flowers yourself! 2. Bacon. Nom nom nom nom. Nom. 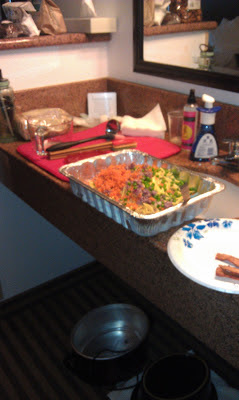 Hotel cooking? No problem! Just BYOCPs...bring your own crock pots! 3. Fuzzy socks. I'm not a sock wearer, but I bought fuzzy slipper socks for the retreat and wandered all about in stocking feet. Cozy! 4. Amazing GF cheesecake made by my friend Angie who owns AJs Decadent Cheesecakes - first cheesecake I've had in years. Oh my word! 5. Rolled flowers and paper pieced birds. I love tiny fussy details on my projects. These are coming to you soon, Tamra Pope! 6. Starbucks Peppermint Hot Chocolate. I had one each day. I'm currently back on sugar detox, but it was totally worth it. 7. New ZING embossing powder. 4 bucks worth of crafty heaven. 8. Microbeads. Tiny, silver, sparkly, and fun to pour back and forth. See them in the flower centers? LOVE! 9. My perfectly adorable new tiny pink scooping spoon from my friend Linnea. Works great with #7 and #8! 10. This picture of my friend Angela. 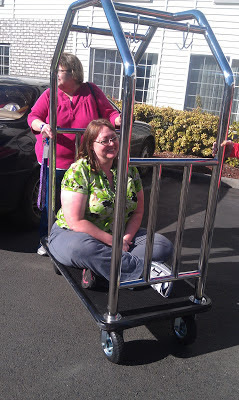 She broke her leg so I drove her to the coast and we sent her scooter in another car...but scrappers don't give up when our retreat house double booked and scrappers won't leave a friend to sit in the tiny cramped car! This will be my favorite pic for a while. I think Imma gonna make it my phone background. Or maybe not...don't want to give my dear boys any ideas...still giggling...Make it work! 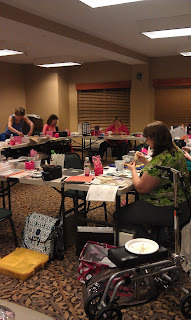 Not the listicle I intended to write, but a good snapshot of the fabulous craft weekend I just spent with some of the most hilarious and amazing women I know. Next time you should come too! 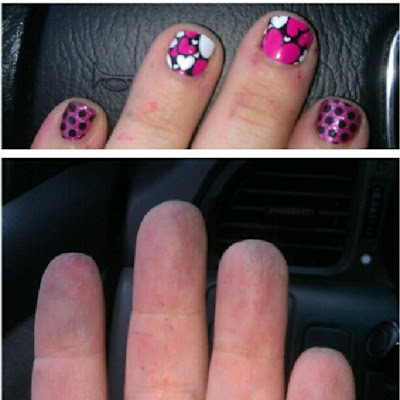 Check out my first layered Jamberry application! That fab Black Polka Dot on Clear went on OVER some Raspberry Sparkle to make a new combo nail. How fun is that? I just applied the Raspberry Sparkle first (heat, trim, file), then came back and applied the clear polka dot wrap right on top. It was easy peasy! This is a messy Instagram pic, but I've been stamping up a storm in the Stamp Pad all weekend, and my fingertips are literally stained a pale Slate color that no amount of handwashing will remove right now. That Slate tint is accented by Lagoon and Cranberry splotches (a little sneak peek into my post for Blog Hop later this week! ), so my hands are basically a wreck right now. But flip over and my Jams still look great, even after all the paint, ink, and handwashing! I thought maybe the double thickness on the layered Jams would peel up, but so far it's holding string a week later! Can you tell I'm stoked about being able to alter my Jams...craftiness is an addiction, I tell ya! To celebrate this new Jamberry crafty manicure I'm giving away a 1/2 sheet of the Black Polka Dot on Clear Jams to two different lucky ducks this week on Friday! That's enough for a full Mani and Pedi! 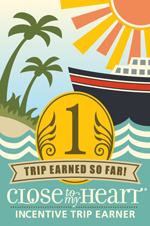 You can earn extra entries by sharing my giveaway and tweeting each day, too. 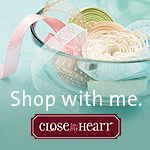 Good luck to you, and check back for more art and a New Product Blog Hop coming later this week! Before I hop into the Listicle this week, here's a little peek of the Valentines (Pinterest inspired, of course) that I had the whole family whip up this weekend. I'm linking this up to Paper Issues It's In The Bag Challenge, since we loaded these cute fish into a crinkly cello bag! I Cricut the circles and made the original sample. Hubby stamped the fronts, trimmed the sentiments, and helped me load and twist tie the bags. Gabe stamped the backs - and he even used second generation to add swirls to the background behind the writing! MAx helped eat the extra gluten free swedish fish. Then both Gabe and Ben got to fill in their classmate's names and sign their fishbowls. All while I stamped away on the fabulous project I can't wait to share with you...later this week for New Product Blog Hop. I love that the boys are old enough to start taking on part of the crafting work fun! Stasha's topic this week for the Monday Listicle is bound to be a touchy subject for my dear hubby. I am fairly easy to please in the present department, if you ask me. I don't expect fancy jewelry, expensive electronics, hard to find items. Time was when a nice peppermint mocha and a chance to sleep in would be the most appreciated gift! But of late, my hubby has been trying really hard to knock my gift receiving socks off...and missing the target despite his best intentions. In case he's reading this...just go to Jacobsen's Books and ask Tina. You're shopping local, supporting a friend's awesome business, and you can never go wrong with a book! 1. Straws. One birthday my hubby and the boys went to the dollar store. I got straws that year. 3. Sparkle Uggs. Now, I kind of set him up on this one - I did tell the boys Mommy wants Sparkle Uggs, giggle, snort, tell Daddy. But I was joking - have you seen how expensive those suckers are? Really, I am very practical, and so is he, or so I thought. So hubby dutifully goes off and without regard to budget or common sense purchases some sparkly, sequin loaded Uggs for Christmas...that are white. They are like bridal boots or something. We live in Oregon. Where it rains incessantly. So the second I step out of the house in the pristine sparkly white costs-as-much-as-our-car-payment boots they will be irrevocably ruined. Thank goodness for Zappos and free returns. It's the thought that counts (again)! 4. Two holidays in a row he had the boys make copy paper signs with crayons early in the morning, photog'd them, and made me a screen saver. The first time I was touched and very pleased. The very next holiday...repeat...not so touching. He's been warned that ship has sailed. 3 sheets of copy paper, however lovingly crayoned, loudly, outside my bedroom with lots of "Shhhh! Mommy's still sleeping!" do not count as a present for every holiday ever. The thought doesn't count three times. 5. Once in college he bought me a sweet little pearl necklace...on a gold chain. I am not a fan of pearls or gold jewelry. I'm more of a silver and rhinestone, or hippie beaded girl. I wore that necklace for years, just for him. Then it got, ahem, lost. I don't think he noticed. 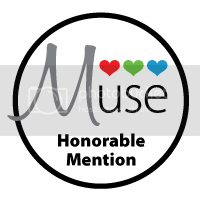 Now in all fairness, I think I'm gonna flip this Listicle and list the last five as Oh No You Didn't Awesome Gifts from my Hubby, since he is actually a sweetheart who really does try hard. It's my Listicle and I'll be nice if I want to! 6. Sometimes he brings me flowers from Trader Joe's for no reason at all. You know, the $4 bouquets of cheapo flowers, and that totally fits my practical nature and budget. Plus it feels nice to know he thought of me. 7. On our first anniversary he took me out to a "fancy" dinner at Mallards in Stockton. Hey, we were in college - that's as fancy as we could afford or fathom. 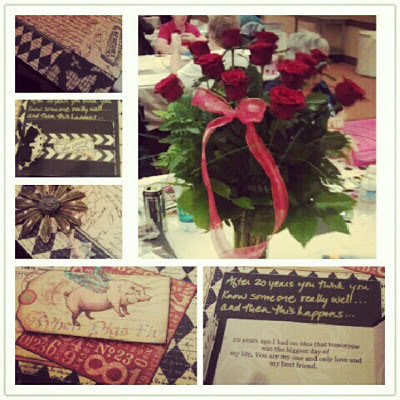 Anyhow, when we got to the restaurant the table was all decked out in roses and it was just so out of character for him. He's an engineer. Logic and sci-fi rules the roost round here - roses (and the effort to get everything set up ahead of time in secret) do not compute. 8. For our second baby he got me the newest Stephen King novel to read at the hospital. Some friends may be horrified that my push present was a horror novel. To me it proves that he knows me well - nothing better for me than a new book to read, even if I'll be reading it while exhausted and nursing a newborn baby. 9. Last Fall I was at a n all day crop on our 20th Anniversary...yes, he let me go out to scrapbook on our Anniversary, watched all three boys, and tried not to ask me any questions all day. That's love, man. 10. 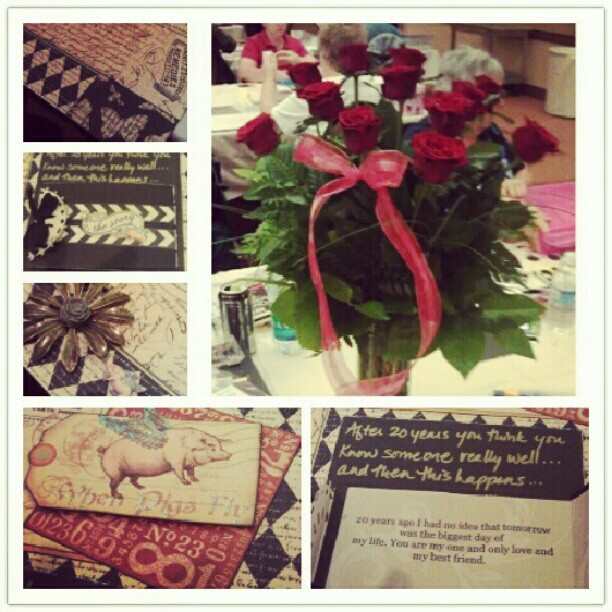 To top off the scrapbooking retreat amazing gift...he had roses delivered to the crop! When they brought in the flowers and started to announce how someone's super fab hubby had sent roses to a lucky gal I was all, "Awww! How sweet is that!" and never stopped cropping to pay attention that closely...it couldn't be me...and then it was! I was so surprised! I am not kidding, I really couldn't believe he had done such a sweet and extravagant thing. It did not fit my budget plans, but it certainly was not returned. And after the flowers arrived I didn't have any trouble finding my table any more, lol. I scrapped the pages for the sweet card and flower pics right there on the spot. That's it for me today - except for this quick reminder to go out and vote for your favorite card in the Practical Scrappers Top 20 contest. The link takes you to my card and a link where you can vote - for me or for any of the other fab entries too! I am so excited for my Stampin' Ladies to come over Friday night and crop these fabulous Flirty papers with me! I combined the Flirty Workshop On The Go with the Pixie Glitter Alphabet and Sparkle Flourishes for these floral packed pages. These first two pages are based on the CTMH instruction brochure included in the WOTG package, with a few twists, like adding Cricut cut flowers to the Dimensional Elements Tree included in the kit! I love forming these tiny flowers using my piercing tool kit. I flip the mat over and used the back, rounded end of the tool to form the simple flat flowers into rounded buttercup shapes! The second set of pages was inspired by these pages by the fabulous Dana Kessler. I love how she stacked the dandelion image in the corners. I added a bit of glitter glitz to each flower, smudging the dots with my finger for a softer effect. The Pixie Glitter Alpha letters were super easy to position using my tweezers. 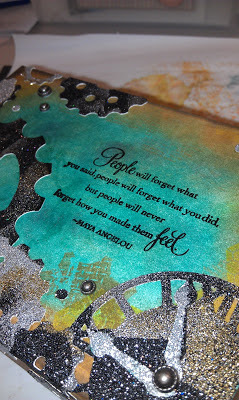 I also extended my bitty sparkle stash by using leftover sections of the Flourishes. I popped off the excess sparkles from the flourish and applied them here with my Tweezers and Liquid Glass. Page 5/6 is my favorite set I think. Each little banner is formed by rolling them on the handle of my piercing tool. I still cut apart the flourishes, though I did keep them relatively intact. I even built myself an extra "o" from a "q" and some exclamation points from the "j"s! I've been wanting to incorporate the formed flowers into a layout for a while, and this layout seems like the right spot. The Flirty Raspberry flowers pop against that background of Dakota Wood Grain! 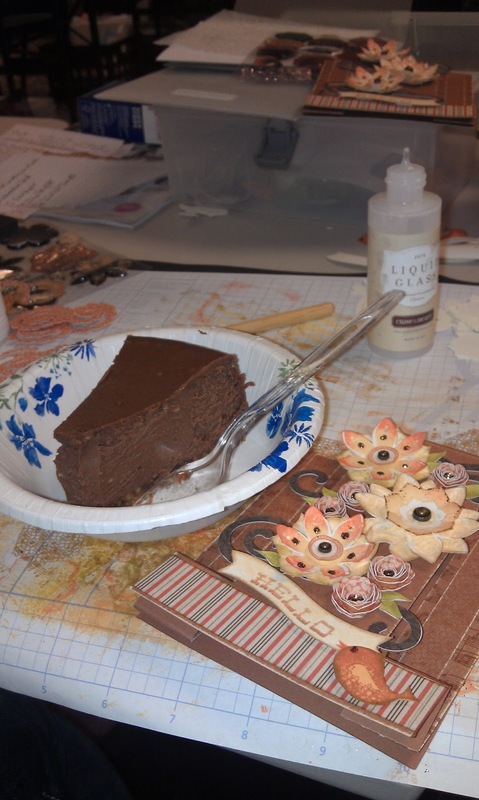 I'm sharing these pages on Make It Monday at An Original Belle - got check out the awesome collection of art and recipes! Last chance to enter my NEW PAPER giveaway - winner to be announce on Friday!